Georgian Bay Forever is working with Dr. Kevin McCann of the University of Guelph, and the Canadian Centre for DNA Barcoding to catalogue all the aquatic organisms in Georgian Bay. This will help with measuring the impact of environmental stressors like climate change and human activity such as shoreline development as well as aiding in future conservation efforts, ecosystem monitoring, forensics, and tracking invasives. All the specimens collected and identified will also contribute to the International Barcode of Life , a multi-nation effort to catalogue the world's biodiversity. Here is one example from Georgian Bay's Aquatic Species Library. Have you ever felt like you are "swimming through bath beads"? The Linnaean classification system, specified in Carl Linnaeus's Systema Naturae (1735) divided living things through a process of narrowing categorization. This methodology evolved into the narrow classification system that is used today, and noted below. Learn about the DNA barcoding project. According to sources (noted below with thanks), it might be groups of pea-sized Holopedium gibberums stuck together. This species has an outer gelatinous mantle hiding a much tinier body. A jellylike mantle makes this zooplankton organism many times bigger than it's actual size thereby scaring away predators but also acting as a kind of flotation control mechanism as it migrates. Like many zooplankton, the H. gibberums migrate upwards towards the surface around sunset and return to deeper water in the daylight hours. The organism has six legs that help it swim; as a filter feeder, it separates out plankton or nutrients suspended in water. They are often found in oligotrophic or low nutrient conditions. While the mantle helps its buoyancy and aids in scaring potential predators, these globby coverings are eventually shed in its life cycle often ending up blown on shore where they can be mistaken for tiny pieces of plastic or pollution. Reproducing sexually and asexually, the abundancy of these organisms can vary from year to year, with the greatest potential numbers being between June and September. They are native to the Great Lakes, although relative to other native areas some articles suggest their numbers are low there. 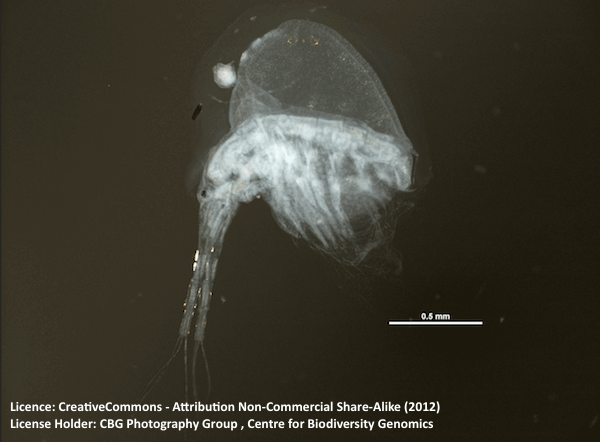 The invasive zooplankton, the spiny waterflea Bythotrephes longimanus is thought to potentially augment the population of this species by eating other smaller zooplankton and eliminating some competition. For more information about the DNA barcoding project for Georgian Bay. Please visit here. We can't stop now! Please donate to Georgian Bay Forever to ensure projects like these continue. Georgian Bay Forever is a charity that funds and supports scientific research, restoration projects and education that protect and enhance the waters of Georgian Bay, as part of the Great Lakes. Our vision is that Georgian Bay waters are healthy and thriving for future generations. Learn more about how you can support out work. Thank you to the sources for information in this post. Note - We try to bring together information to help understand this species. We do use sources to provide information and visuals. We do our best to attribute properly and try very hard to get it right. If we have made an inadvertent mistake around recognizing someone’s work or misinterpreting the work, please let us know via email at communications and I will correct.